Found this one nice a 4x4 diesel van being offered for sale in Los Angeles, as shown here is about light and toughness van was build in Japan now ready to serve American user, powered by a 4 cylinders turbo diesel engine mated with 4WD drivetrain made by Mitsubishi Motors known as the Delica van. As show here is 1993 model legally imported into the US in awesome shape in and out and free mechanical problems. High Top Super Exceed L300 Mitsubishi Delica 4x4 turbo diesel 1993. Restored. 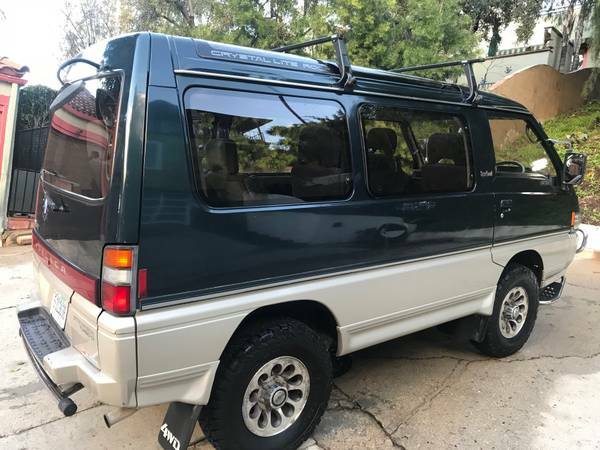 Low-miles example of the reliable and fuel-efficient Delica. It has been well maintained and legally imported into the US. Everything works, it runs strong with no rust. 96k miles. No mechanical problems. Engine rebuilt at 88k miles, reconditioned radiator, new water pump, new brakes, ball joints, shocks, filters, fluids, new crankshaft, new head gasket, new big end bearings, rebuilt fuel pump and injectors, all belts, thermostat, new valve cover gasket, etc.. I have all receipts from 2015. New BF Goodridge all-terrain KO2 30"x9.5" Thousands and thousands spent on restoration. It has the "Crystal lite roof" option, meaning it has 5 sunroofs! 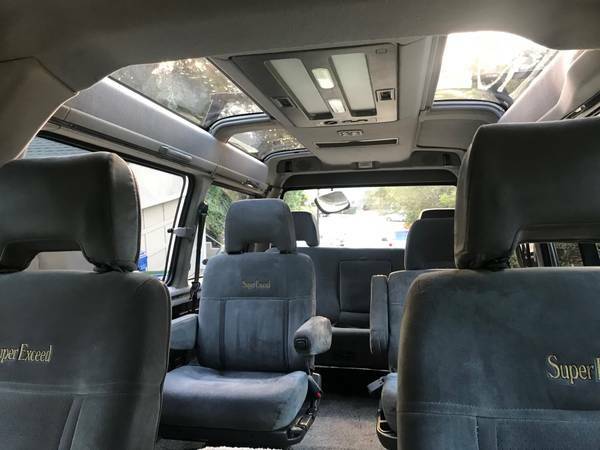 The 4 in the back have motorized shades that automatically open and close and you can operate from the front or the back. 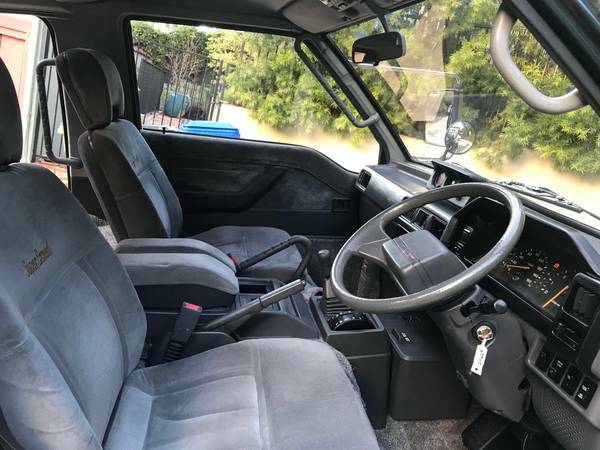 Power windows, locks, steering, etc., fog lights, compass, thermometer and "tiltometer", tinted windows, OEM mini cold/hot/icebox, OEM bush bar, automatic transmission with overdrive, dual zone A/C controls for both front and rear. LED interior lights so doesn't draw lots of power, aftermarket stereo with USB jack. It has a throttle lock knob that, by design, can functions like a type of cruise control. It has a roof rack and two swivel captains chairs that can face any direction and fold down into a bed. Not all the sunroof shades work but the can be repaired. This vehicle was legally imported into the United States. This is a RHD/JDM vehicle from Japan. It has all the proper importation documentation. It has a clear Montana title and is currently located in Los Angeles. I am happy to deliver anywhere in the US for a fee. It has no rust on the body or frame. There is some minor surface rust on some components underneath but nothing serious. No leaks. The interior and exterior are about a 8/10. The restoration was intended to replace anything that could potentially be a problem in the future in order to make this thing be as maintenance free as possible for years to come. Now that Delicas are getting a larger cult following here there are many parts suppliers in North America. It also shares many parts with a few Dodge trucks that were sold in the U.S. so some parts are widely available. No speed demon but can cruise on the highway at 70mph. It has lots of low-end grunt. Being a turbo diesel it gets great fuel economy. If you drive REALLY slow it nearly 30mpg but at 70 it gets less. 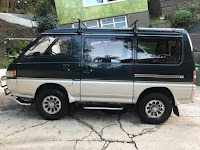 With the 4x4, 2-speed hi/low transfer-case, incredible approach/departure angles, limited slip differential, and large aggressive tires, this van has pretty good off-road capability. However, unlike a Sprinter they are also small and smooth enough to function perfectly as a daily driver with the footprint of a regular car it can fit in parking spots and in underground parking. Huge interior space (for instance, you can fit 4'x'8 plywood in the back). With the bed in the back and the curtains it is also great for "urban stealth camping"/van life. It is the ultimate road-trip van. 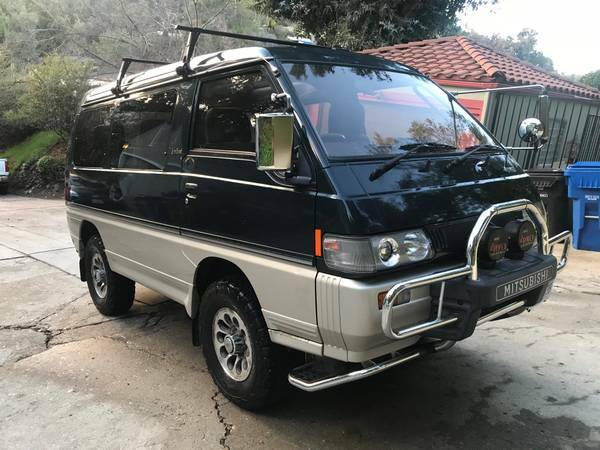 Arguably this is the most reliable Delica of them all. The simple diesel engine is commonly used as a base for bio-diesel/veggie oil conversion. Has the venerable 4D56T 2.5L turbo diesel, which is very popular globally; it was the engine used in the Pajero, where it dominated the Dakar. Used 4x4 camperized Sprinters are hard to find under $100k; VW Syncro Vanagon can go for $70k and up: (http://www.gowesty.com/vehicle-sales.php) You have to restore and re-engineer Syncros to make them reliable. As is, this will be infinitely more reliable and has much more readily available parts for a fraction of the price of a VW 4x4 van.